To reveal the shared risk factors for chronic obstructive pulmonary disease (COPD) and lung cancer, and to analyze the mediation effect of COPD during lung carcinogenesis. We conducted four independent case–control studies included 1,511 COPD patients and 1,677 normal lung function controls and 1,559 lung cancer cases and 1,679 cancer-free controls during 2002–2011 in southern and eastern Chinese. 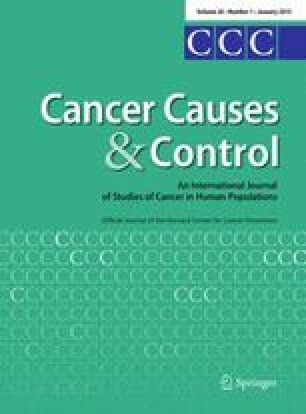 Eight factors were observed to be consistently associated with both diseases risk, including pre-existing tuberculosis, smoking, passive smoking, occupational exposure to metallic toxicant, poor housing ventilation, biomass burning, cured meat consumption, and seldom vegetables/fruits consumption. Furthermore, smoking and biomass burning conferred significantly higher risk effects on lung cancer in individuals with pre-existing COPD than those without. COPD also had significant mediation effects during lung carcinogenesis caused by smoking, passive smoking, and biomass burning, which explained about 12.0 % of effect, 3.8 % of effect, and 6.1 % of effect of these factors on lung tumorigenesis in turn. Our study mapped a shared spectrum of etiological factors for both COPD and lung cancer in Chinese, and COPD acts as a mediator during lung cancer development. These observations should be in consideration for the prevention of both diseases. The online version of this article (doi: 10.1007/s10552-014-0475-2) contains supplementary material, which is available to authorized users. This study was supported by the National Natural Scientific Foundation of China Grants 30671813, 30872178, 81072366, 81273149, 81473040 (J. Lu), and partly by 81001278, 81171895, 81472630 (Y. Zhou); 81402753 (L. Yang), 81102159 (L. Zhang), 81102061 (Q. Jiang), 30972540 (B. Liu); and Guangdong Provincial High Level Experts Grants 2010-79 (J. Lu). We thank Dr. Zhanhong Xie, Dr. Wanmin Zeng and Dr. Ling Liu for their assistances in recruiting the subjects; Dr. Lisha Zhang for their laboratory assistances. No conflict of interest exists for any author.